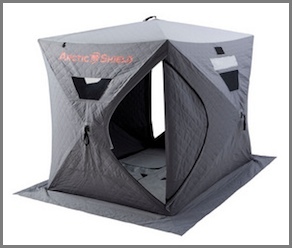 Onyx ArcticShield Double Layer Quilted Shelter - 9882CHR Number of Anglers: up to 4 Footprint: 72” x 96” Height: 84” Weight: 40 lbs. BONUS! Removable Thermal Floor Included! • Quick and Easy Set-up • Mildew and Fade Resistant • Heavy-Duty Quilted Polyester Construction • Removable Thermal Floor • Four Ice Anchors • Carry Bag • Fiberglass Support Poles • Four Windows • Two Zippered Doors Includes a removable floor containing ArcticShield heat retention technology keeping you warmer while giving you easy access to the ice. Conveniently rolls up when not in use.